Arcades | SDTEKKEN.COM - TEKKEN News Resource! why so expensive the arcade tekken dr in your country?my country only need ringgit malaysia RM0.50 per one game.i dont know how much if convert to your country currency. When exaclly Tekken 6 Is coming out? In our country Tekken DR only costs 7 Pesos per continue/play convert that into dollars that is 6 cents…..
wer is that country dragunov?philippines? wer cn i find that arcade machine?pls tell..
>_< why doesn’t santa cruz have this stuff? It costs 25 cents to play a game at SDSU, I usually play when theres a huge break between my classes haha. where can u find one in singapore and hongkong? AceUnlimited, There is a tekken dr machine at Frankies in Raleigh, NC. I went Horton Plaza 2 days ago, there is no TEKKEN machine. does philippines have tekken 6 already. With the PS3 in hand there’s no need for arcade machines anymore it should just come out straight to the console and just boost up the network ! tekken 6 is already released in the philippines. There are 2 Tekken 6 machines at Plaza Singapura arcade ^^ $1 per game, and have sell memory card too. There was no “Tilt” in plaza bonita…..
As of right now, Plaza Bonita is going under major changes within the mall. Plaza Bonita Tilt is going to be relocated sometime in the future. Oh, then could you tell me what arcade you guys usually go to? where can you play tekken 6 here in california? im near LAX. this site is good, its always updates about tekken. but maybe you can post some pattern or combo pattern, so we can learn how to play it well. where can I rent the arcade. tekken 6 at mission valley now! i even saw a girl beast. So is Mission Valley the only mall with T6? I could’ve swore there was one also in Tilt at Horton. sorry guyz but tekken 6: bloodline revellion is already out here.. and tekken 6 machines are being dump..
iloilo philippines cost 6 pesos baby more cheaper! Plays on a Tekken 5 concole/cabinet. Bring your own controller to really enjoy the game. While there, try out any of the newest fighting games including BlazBlue and Streetfighter 4 and the other games in the past 10 years. teKKEN 5 console part 2 and darK reSurectiON..
kya dramma hai dimaag kharab karke rakh diya…………..
Austin Texas, at arcade ufo has two tekken 6 cabs linked. TILT SHOULD NOW MAKE TEKKEN 25 CENTS!!!! its already on psp dude…. they now have tekken 6 at the HORTON PLAZA TILT. The only bad thing is that it has a 2 minute time limit and then logout and goes to the xbox dashboard. So basically it is a xbox in a arcade maching that makes you share even if you win. 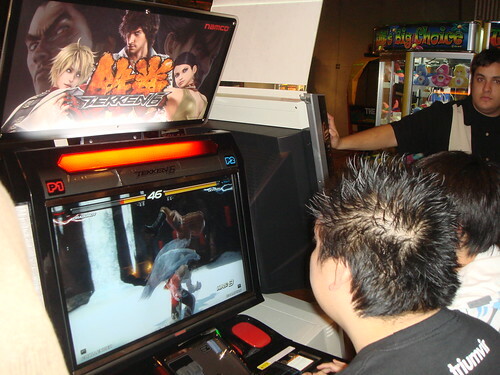 in timezone here in the philippines, a game on a tekken 6 BR machine would spend you about 19-20 pesos, roughly about 47-50 U.S. centavos. well, that’s for machines in timezone. in some not-so-well-off arcades a game of tekken 5 DR would cost 7 or 6 pesos, depending on the location of the machine and of the store. its so cool it will make your arms tried but fire at same time. awwh my old Job but a fun one!!! mission valley tilt!!! tekken 6 need to drop to 50 cent!!! its not even BR!!! lol well find me on xbox live! !